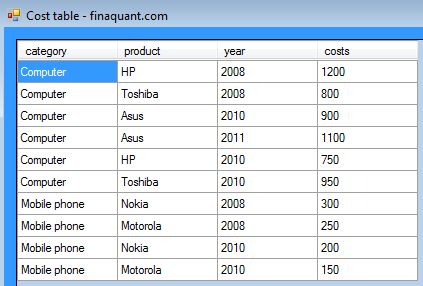 finaquant® protos is a non-commercial calculation engine (.NET library) based on table functions. Please visit its product page for more information and downloads. 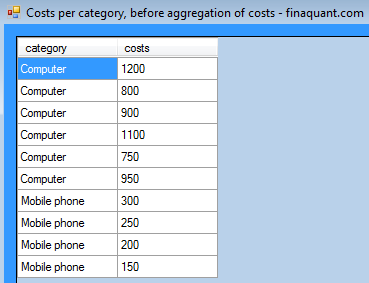 Four simple examples related with price calculation and cost aggregation are presented below to give you some feeling about table functions. These examples are included in the demonstration function Getting_started_with_finaquant_protos in the code file Demo.cs in Visual Studio project FinaquantProtosStarter. You just need to run this demo function by pressing F5 after placing the cursor in a code file. Note that resultant price margins are 25% for computers, and 40% for mobile phones, as seen in the table above. 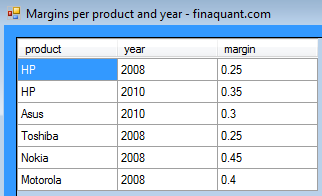 In this example, price margins are specified in more detail; not per category this time, but per product and year. 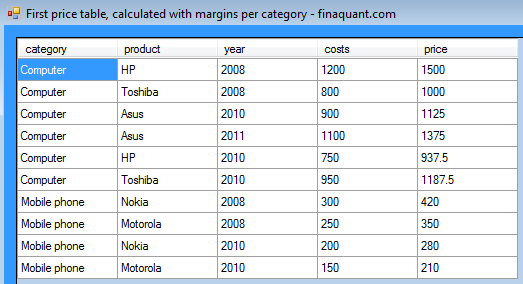 The default price margin is 20% if the margin for a product-year pair is not specified in the margin table. Note that a price margin of 20% was applied on the product-year pair Toshiba-2010, because its margin was not explicitly specified. 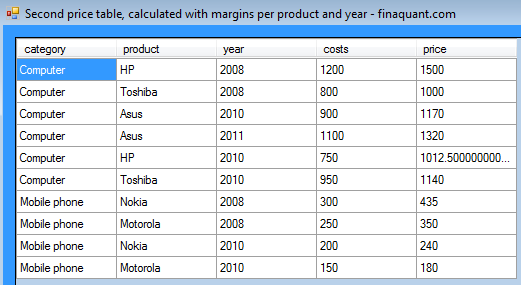 As specified in the margin table, a price margin of 25% was applied on HP-2008, and 35% on HP-2010. 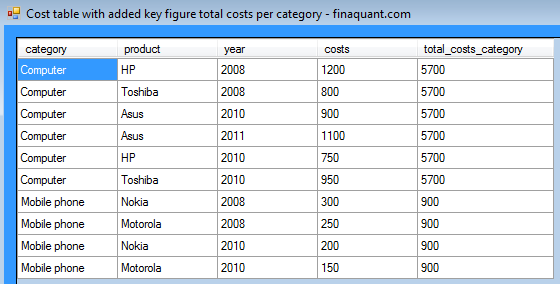 In this example, the initial cost table is not aggregated to obtain the summary table (costs per category), but a new key figure total_costs_category is added into the table as additional summary information. For finaquant® protos this is just another kind of aggregation. This entry was posted in Calculation engine and tagged calculation engine, products, video. Bookmark the permalink. Quite impressive work thanks for sharing. If so, apart having possibility to use table/matrix/array level operations without any dependency to specific DB’s (oracle, SQLServer, DB2 etc…) or tools/environments (R, Mathlab etc…), your library brings any further concrete advantages, to consider it much more convenient than it’s alternatives or you mainly you tried to bring a compact, chip replacement, to these relatively difficult to maintain and expensive commercial solutions? Yes, table calculations directly within the .NET framework, with in-memory data is one aspect of our calculation engines. These table functions are the infrastructure of an upcoming real calculation engine based on table functions. The other aspect will be features like ability to define and maintain network calculations with multiple chained nodes (or contracts), simplified parameter management etc. that will be built on this infrastructure. Only these additional features will make our products real calculation engines. I am also a proficient user of math software like matlab or R. There are cases where you want to make operations with table data. Converting these tables first to matrices, making the operations, and then everything back to tables is an error-prone and tedious task. Table functions offer a more direct and intuitive way of doing operations on tables. Once (and if) you get used to working with tables as a matrix guru, you will understand what I mean; you won’t want to go back to matrices for structured higher-level table data unless it is strictly necessary. I haven’t seen so far a software (maybe there are some, but I coudn’t find any) including stored procedures of certain databases, which offers table functions in the entirety and with the mathematical clarity as finaquant intends to do. I have seen some patches table functions embedded in expensive software for applications like financial planning and reporting, but they are not extensive, complete, and well-defined (in the mathematical sense) enough for users with some analytical flair, who want to configure (or program) their calculations themselves without much reliance on external support.